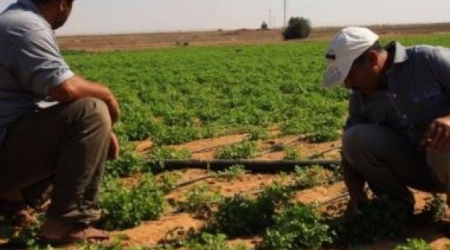 Israeli drones, Tuesday evening, sprayed toxic pesticides on the Palestinian agricultural lands to east of Khan Younis, in the southern Gaza Strip.Media sources reported that Israeli drones sprayed hundreds of agricultural lands with pesticides, causing injury to the crops in that region. Al Ray Palestinian Media Agency notes that this material eliminated hundreds dunams planted with peas, spinach, al-Saleq and zucchini, inflicting farmers with considerable material loss. It is not the first time that farmers reported such incidents. See imemc.org/article/74429 for more info.